The project examines the women’s place in married life. 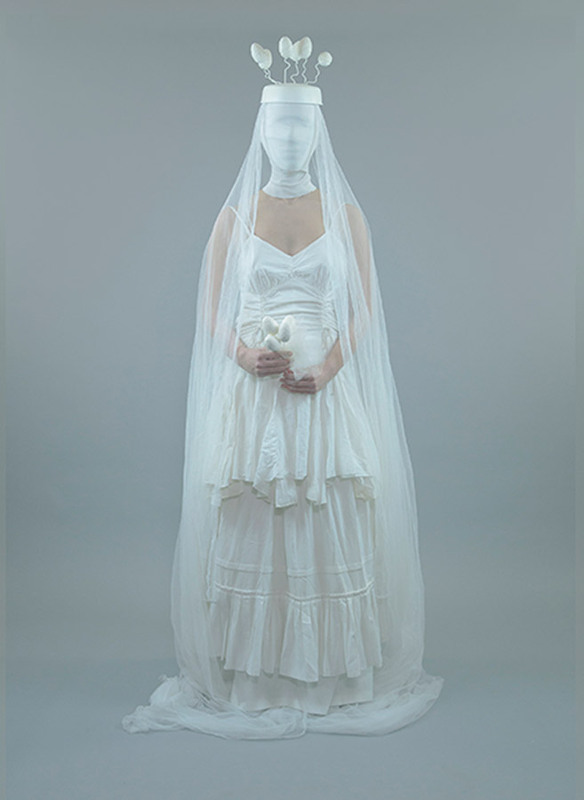 “NYFES” are bridal depictions where the subjects act as surrealistic hybrid sculptures. Their faces are covered with masks, symbolizing the depersonalization of women by entering married life. Their dreams, expectations and insecurities are hidden below the masks. The household items, which occupy a large part of their everyday life, are transformed into a powerful bridal symbol, the bridal bouquet. These depictions do not intend to create a fairy tale or to promise happiness. The project “NYFES” stands against old and new stereotypes concerning marriage conventions and the roles that a woman is called upon to deal with. All the figures are enigmatic, standing in a neutral timeless space: it is the midspace of reality and imagination. .